Without these beautiful, caring and loving couples, Charlotte Fête would not be the same. To us, it's all about the people. We love the flowers, the linens and the "pretty", but nothing compares to telling the stories of those who have partnered with us. READY TO BECOME A FÊTE COUPLE? Oh, Jamie and Jake. What an amazing pair these two are. Their wedding at Founder's Hall in Uptown Charlotte was a night that we will never forget. Lily Greenthumb's provided immaculate floral, and Split Second Sound kept the crowd on the dance floor all night. We were SO thankful to design and manage this special couple's perfect day. Jamie and Jake will ALWAYS hold a place in my heart and I'm so glad to call them friends after this experience! Just look at these two! Picture perfect in every way. Their Duke Mansion wedding was one of the most fun Fêtes of the year. Laura and her team at the mansion were incredible from start to finish. Lynette at The Bloom Room created the most amazing floral installations which covered the entire venue. Split Second Sound had the Levine Living Room feeling like a club in uptown! We loved working alongside Cheyenne Schultz and her team - they are absolute pros! Meghan and Matt - we LOVE you!!! Genuine happiness and beauty enveloped this entire wedding from start to finish. Lydia and Derek are high school sweethearts who were both raised in the Charlotte area, but moved to Des Moines together a few years back. It was only fitting that they returned to Charlotte to tie the knot at the Mint Museum Randolph, which was the perfect fit for their art nouveau motif. Jeff Conti (a family friend) did the floral, which was truly a sight to be seen. Queen City Catering had the crowd fed with a fantastic risotto bar and taco station, alongside other artisan bites! Lydia and Derek, we hope that you move back to the Queen City - we miss you!!! From start to finish, every detail of this wedding was amazing. Sarah and Eric currently live in Atlanta, so much of our planning was "virtual"! Their tuscan vineyard motif was carried out through their design - I'm talking a wine cork seating chart and wine barrel bar, you guys! So many personal details were incorporated, including a custom crest designed by Elle Dee Designs and Kristin Dills. Even their precious pup, Kensie, was present on the wedding day! (She's insta famous, just saying ;) The After Party Experience band (also from ATL) were SO much fun and were the perfect way to get the crowd dancing. Sarah and Eric, we treasured this partnership and are so thankful for you. Anna and Chelsey were classmates at Queen University, and she remembers hearing through the grapevine that Anna had started dating this really great guy named Nate. Their wedding at Whitehead Manor was full of family from near and far (Anna is from Cincinnati - Who dey!). Despite a bit of rain (it's good luck, remember?) we had a blast dancing the night away under a lovely tent, strung with elegant market lighting from Wink Lights. Bookout Blooms provided absolutely fantastic floral arrangements and installations. Our beloved Mint Museum Uptown served as the backdrop for this truly unique wedding. Chelsey and Selena both attended South Mecklenburg High School, but they didn't formally cross paths until Selena's family reached out to Chelsey to inquire about Fête's services. Almost 250 of their closest friends and family members partied the night away in the Silverman Grand Room, and guests enjoyed a nightcap of dog bone shaped BoBerry biscuits (the couple's dog is named Bo)! Selena wore a custom couture gown for the ceremony and transitioned into a more dance-friendly ensemble for the rest of the night. This wedding was a dream come true! 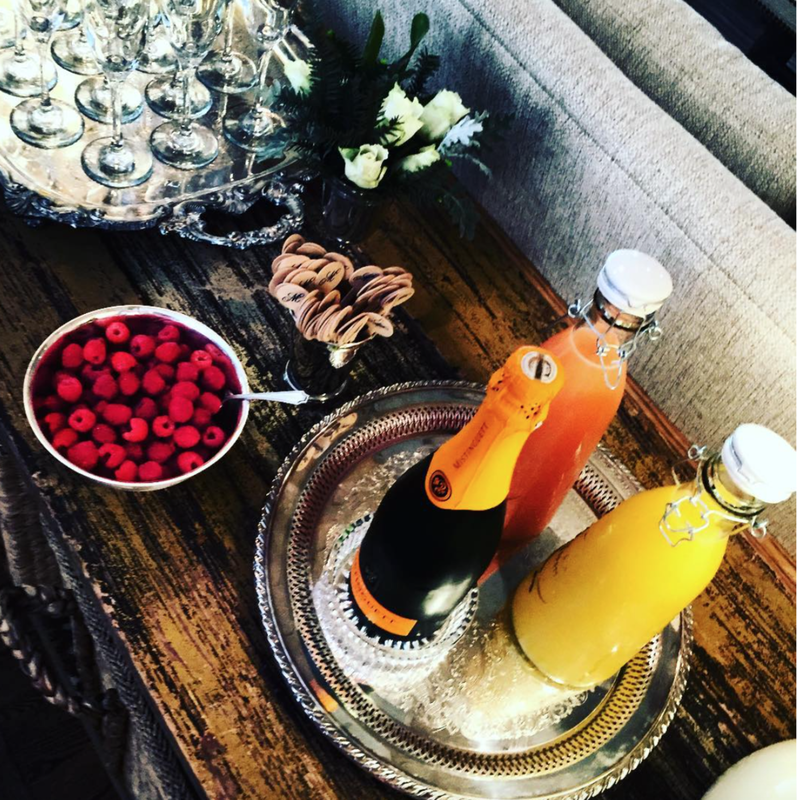 Charlotte Fête became Beech Mountain Fête in July, when we traveled from the city up to the gorgeous NC mountains for this lovely affair. The Beech Mountain Country Club hosted an intimate wedding ceremony and reception on a truly perfect day. DJ Dave Blanks filled the ballroom with amazing music and Candice Wood shot absolutely stunning photos of the bride and groom. This was an incredibly special couple to Chelsey - Denise is her "great-grand little sister" from Chi Omega at Queens University! We were back at the Mint Museum Uptown for this lovely Sunday wedding, kicking off a long weekend of Fourth of July festivities. Kathryn and Andrew were married at the contemporary and modern Hope Community Church and celebrated with their closest friends and family in the Silverman Grand Room at the Mint. Jimmy Bloom Floral provided lush greenery, colorful flowers and stunning floral elements and Suarez Bakery created an instagram-worthy watercolor motif cake. Modern, uptown elegance at its finest. Megan and Jared were married at St. Peters Catholic Church and celebrated at the Mint Museum Uptown. Guests enjoyed skyline views while dancing to the sounds of Hipshack. Lily Bees Floral provided the floral touches which completed the overall look, designed by Charlotte Fête. We cannot wait to show you more of this amazing wedding! This chic Uptown Charlotte wedding was incredible. Naomi and Nick were married in front of the lovely Charlotte cityscape at Foundation For the Carolinas. Jonah from Split Second Sound was on site to provide spectacular entertainment and guests enjoyed a delicious meal from Something Classic. EcoFlower provided all of the sustainable and reusable floral decor! Before this fabulous Fête, Naomi and Chelsey first met at Xtend Barre, where Naomi teaches fantastic barre classes. Charlotte Fête was absolutely honored to work with this couple on their gorgeous spring wedding in April 2017. The ceremony was held at Temple Beth El and we danced the night away at Providence Country Club. Men of Distinction provided the ideal party environment and Lily Greenthumbs furnished stunning floral centerpieces that were present throughout the club. This wedding will hold a special place in our hearts, as the inaugural wedding of Charlotte Fête as an "official" company. Chelsey provided Wedding Management services at the Mint Museum Uptown and St. Peters Catholic Church in Charlotte, NC. Guests enjoyed a delicious meal from Something Classic and danced the night away to The New Royals. Chelsey was hired to design and plan a 40th Birthday Party for a local pediatrician. She created a simple and elegant affair at a chic venue in Uptown Charlotte. Guests enjoyed signature drinks and even participated in the Mannequin Challenge! For this gorgeous in-home baptism party, Chelsey provided styling and management services. The parents were able to be present and fully at ease during the church service while Chelsey tended to the catering, decor and vendors at home. READY TO SEE YOUR EVENT ON THIS PAGE?